In late March I was back in NYC for work. It was strange being a “visitor” in the city I know best. When my mom rang up asking to meet up for an early dinner in SoHo, I took the opportunity to try out a tiny place on Watts Street I’d walked by a billion times before but never tried called Mooncake Foods. OMG. WHY WASN’T I EATING HERE EVERY DAY OF MY NEW YORK CITY LIFE? Mooncake Foods is the epitome of one of the things New York does best: Amazing, mouth-watering food at affordable prices. I’ve had dreams about this meal ever since coming back to Denver. Dear lord. We started out with the steamed peashoot and garlic dumplings. 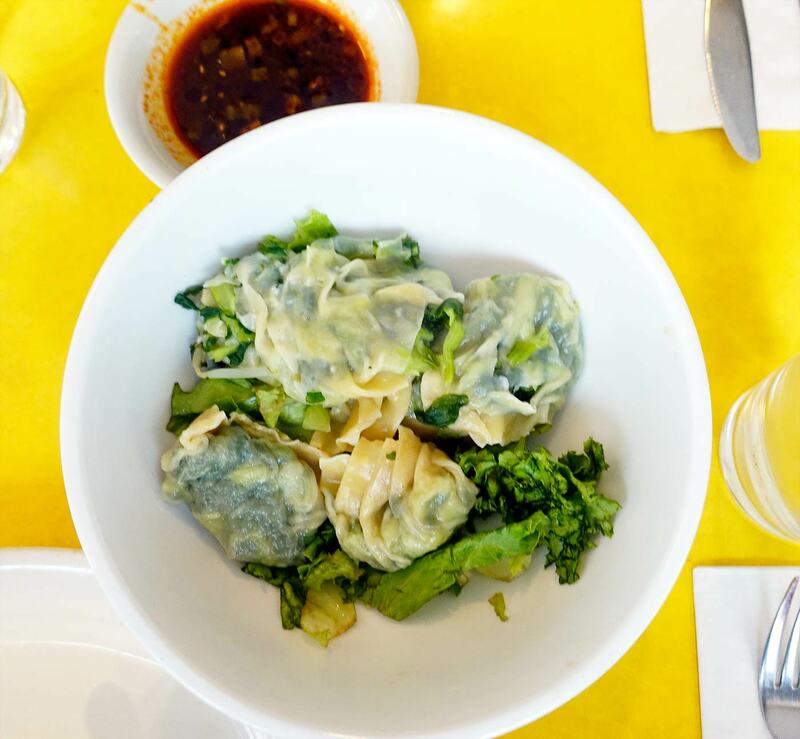 These delicate little pillows of green goodness in a wonton wrapper were perfectly paired by a tangy dipping sauce. For the main course I ordered the miso-glazed salmon, which arrived with a fresh green salad with carrot ginger dressing. I took one bite of the salmon and I almost started crying. The fish was incredibly buttery and smooth, with every piece melting in my mouth. 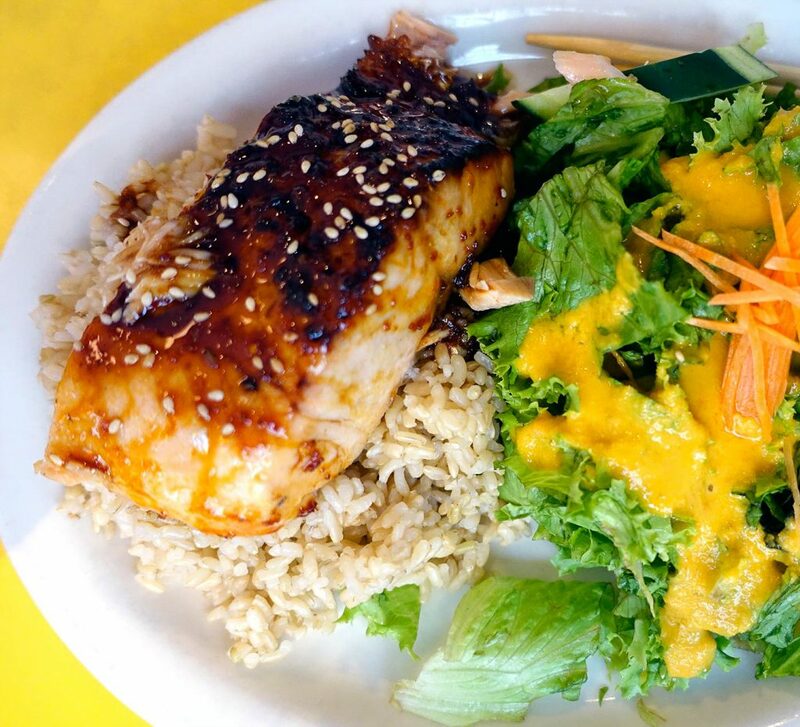 The sticky glaze atop the salmon had a deep, rich flavor and the sprinkling of sesame seeds added some necessary crunch and texture. How they managed to spin this magical meal out of that simple-looking kitchen, I will never know, but I sure am thankful they did. I could eat this dish all day, every day. No four-legged animal protein and lots of greens. Nearly the perfect dish. Do you think you could make this your desert island meal? Crowd: None. Just a delivery guy on his phone. I’m so happy you discovered this place and REALLY surprised it took you this long (Jocelyn and I have been going for years – it was/is her office’s go-to take out place)! The best part? I still remember my very first taste of those peashoot and garlic dumplings because their menu hasn’t changed SINCE THE BEGINNING. That’s a pretty good indication that it never will. Good news, I’d say. Seriously, Giulia. I’m a dope for have never eaten here BEFORE moving out of NYC. Did take out here the last time I was in town — got a dumpling noodle soup. Ugh! SO GOOD STOP IT MOONCAKES!